WASHINGTON (AP) — Moments after Jeff Flake announced his support for Brett Kavanaugh, he was confronted with one of the consequences.Two women cornered him as he got on an elevator Friday, pleading for him to reconsider his support for the Supreme Court nominee accused of sexual assault. The raw, emotional moment was caught on television, capturing the charged atmosphere in the Capitol as senators prepare to vote. A day earlier, the senators heard hours of testimony for Christine Blasey Ford, a California psychology professor who told them Kavanaugh sexually assaulted her when the two were teenagers. Kavanaugh has denied the allegation. 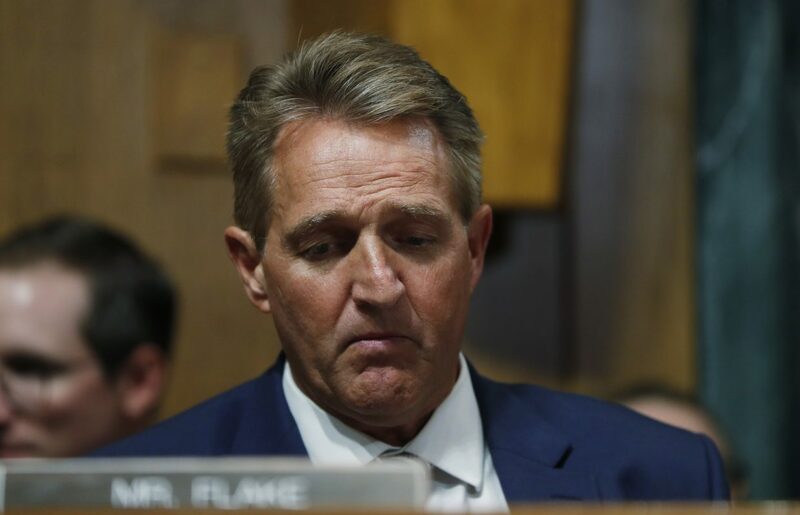 Flake had lobbied Republican leaders to give Ford the chance to speak. He was viewed as a possible no vote, until the announcement Friday morning. The senator on his way to the Senate Judiciary Committee as the two women, who are both affiliated with advocacy groups, told him they were sexual assault survivors. Archila, 39, appeared to block the Arizona senator from closing the elevator door. Flake, cornered in the elevator, shifted between looking at them and looking down. He said, “Thank you,” but didn’t respond to questions on whether he believed Ford’s testimony. The elevator doors closed. A committee vote was set for 1:30 p.m. on whether to recommend Kavanaugh’s confirmation to the full Senate. The women do not identify themselves in the video, but Archila’s group sent a press release following the confrontation confirming it was Archila speaking on camera. Gallagher confirmed via phone to the AP it was her, and she consented to the use of her name.